Rage And Humor Alternate In 'Arab Of The Future' Cartoonist Riad Sattouf uses a loose-limbed comic style to tell the story of his harsh early childhood in Libya, Syria and France — but the cartoony look belies the book's anger and icy cynicism. Riad Sattouf's sense of irony goes deeper than his bones: It runs in his lines. Inside every panel of The Arab of the Future, his graphical memoir of his early childhood, Sattouf's pen frisks and wiggles like it hasn't a care in the world. But both his drawings and his message are more complex than they appear. His story — an account from the perspective of a very young child — seems circumscribed, even picayune. But this childhood happens to take place in Libya and Syria, as well as France, in the early 1980s. With a judicious eye for an anecdote, and even more judicious doses of commentary, Sattouf — a former contributor to the French humor magazine Charlie Hebdo — delivers a vicious denunciation of pan-Arabism and Islamic politics. It might seem impossible to depict the recent history of the Middle East using Sattouf's zany drawing style. His cartoony characters have prune-Danish or hotdog noses and rubbery, lipless mouths — gimmicks familiar from a zillion gag comics. But Sattouf uses this style to establish a subtle and contradictory relationship with his reader. He simultaneously disclaims the reader's attention — No, nothing important going on here — and challenges the discerning few to look closer. This book has inevitably been compared to Persepolis, Marjane Satrapi's graphic novel about growing up in Iran, as well as to Zeina Abirached's A Game for Swallows, about domestic life in Beirut. In fact, The Arab of the Future is a kind of anti-Persepolis in its icy cynicism. In the Arab world as experienced by young Riad, heroism is nonexistent and villainy is petty. Riad's only exposure to politics is through radio broadcasts and his father Abdel-Razak's monologues about Arab pride. Abdel-Razak constantly holds forth to the captive audience of his French wife — the depressed, tractable Clémentine — and his saucer-eyed child. This book has inevitably been compared to 'Persepolis,' Marjane Satrapi's graphic novel about growing up in Iran ... 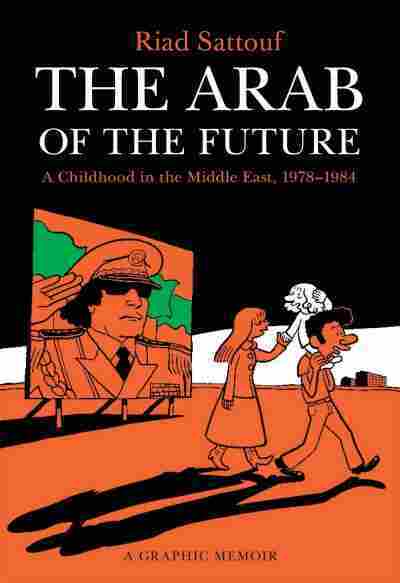 In fact, 'The Arab of the Future' is a kind of anti-Persepolis in its icy cynicism. "For two days, Egypt and Syria advanced into Sinai and Golan. The Israelis didn't know what hit them!" is Abdel-Razak's take on the Yom Kippur War. (The book has been translated seamlessly from the French by Sam Taylor.) For all this bluster, the adult Sattouf observes, Abdel-Razak himself dodged military service. "I want to give orders, not take them!" Abdel-Razak declares. Sattouf's recollection of the Arab world might have been vastly different if his feelings for his father weren't so divided. Abdel-Razak comes across as a self-absorbed, hypocritical manchild, desperate to feel important. Basically kindhearted, he doesn't always do what's best for his wife and son — which, Sattouf clearly believes, would have been to find work in Europe. Instead, the family travels from France to the Mideast and back again as Abdel-Razak secures a series of teaching positions. Seen through young Riad's eyes, Libya and Syria have little to recommend them. The family encounters food shortages, endures too-cold apartments with cracked walls, and struggles to relate to Syrian relatives. Abdel-Razak's brother won't look Clémentine in the eye because she's a woman. At dinnertime, the women eat the men's half-gnawed leftovers. Walking down the street, the family encounters a gibbet with two executed prisoners still hanging on it. Abdel-Razak justifies the practice to an appalled Clémentine. "It's horrible, but it's necessary," he tells her, shielding Riad's eyes. "It sets an example. This way people stay peaceful and law-abiding. You have to frighten them." This isn't surprising coming from Abdel-Razak — it's become clear he'll justify virtually anything to bolster his sense of grandiosity. Clémentine, however, remains a cipher, rolling her eyes but acquiescing to every deprivation and petty tyranny. She only draws the line when some boys torture a puppy to death outside the apartment. "Those kids heartlessly killed a dog, and they thought it was funny!" she yells. "He is not going to school with them ... period. End of discussion!" Soon the family's headed back to France — Clémentine, apparently, has prevailed. But after a short interlude they're bound for Syria yet again. Sattouf depicts himself crying and sweating as the family marches onto the plane. That's the end of the book, the first in what's intended to be a trilogy. (A second volume was published in France in May.) Whatever comes next, it's certainly left its mark; Sattouf's feelings about the Arab world are ferocious. They coexist uneasily with his ironical soul. Sometimes rage wins out, other times it's humor. But he always knows what he thinks about his subjects — even if he doesn't allow the reader to feel the same certainty.